In many areas of the Northeast, moisture and foliage coupled with limited amounts of bright sunshine combine to create ideal environments for mold to form. Mold can be unsightly, but it can also be very dangerous if allowed to form in areas requiring traction. Many school districts have been encountering mold on their synthetic running tracks and game courts, resulting in surfaces than can be very slippery and have resulted in athlete injury. To make matters worse, school districts are prohibited from using many types of chemicals needed to effectively remove mold. 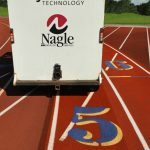 Nagle Athletic Surfaces has the answer to your athletic surface mold that is also safe for the environment. Introducing our Cyclone 5500 High Pressure Surface Cleaning and Water Recovery & Recycling Unit. This unit utilizes heated water that is sprayed under high-pressure onto the surface through a rotating cleaning head, which is capable of removing dirt, mold and petroleum products. To protect the enviroment, the cleaning head contains turbines that rotate at high rate of speed to create a vortex of air and water that reclaims the water and debris from the surface. If mold is a persistent problem on your running tracks or game courts, count on StadiumCare by Nagle Athletic Surfaces to help you get your grip and protect the environment.